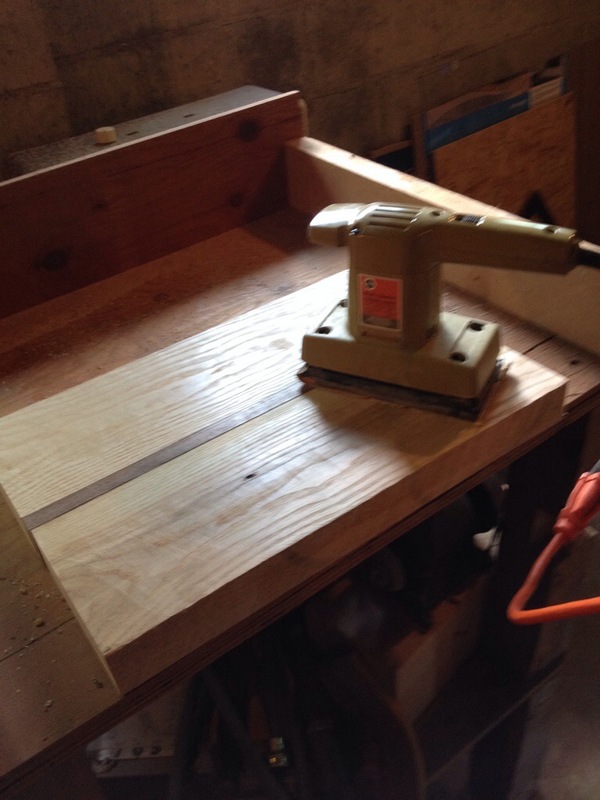 Over Memorial Day weekend, I brought half my woodshop on the road to Penn Hills PA and my grandmother’s basement. With my sister working two jobs and my father having work to do around grandma’s house, it was a great chance to utilize my time and I made significant progress. 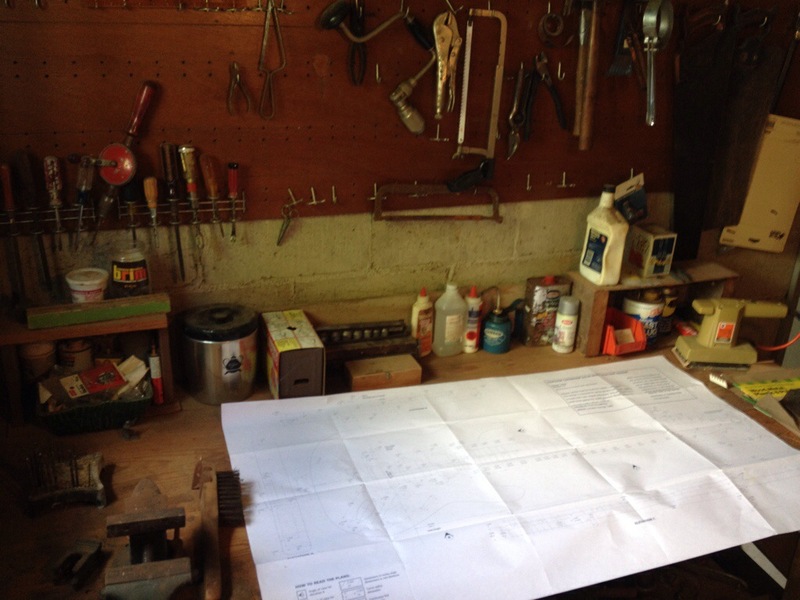 The main work bench in the shop was quite cluttered and there was a significant amount of rust, dust, and general mess in the work area. It took me half a day but I think it was totally worth it to clean it all up. In addition to being generally satisfying, it also allowed me to get full use of the space. The next order of business was jointing up the edges. 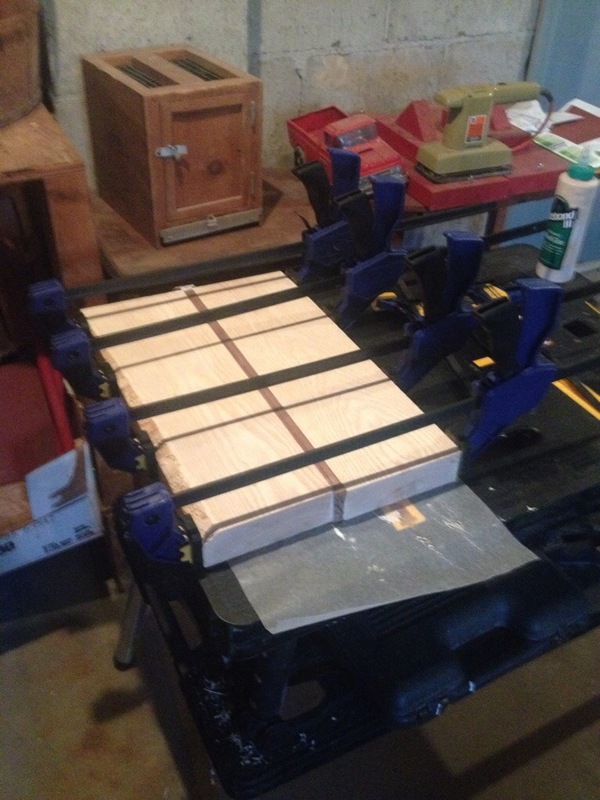 Having only a 1-4″ shank trimmer router and a power planer but no jointer, this required clamping a fence and taking multiple passes to join up the 1.85″ thick body balks. 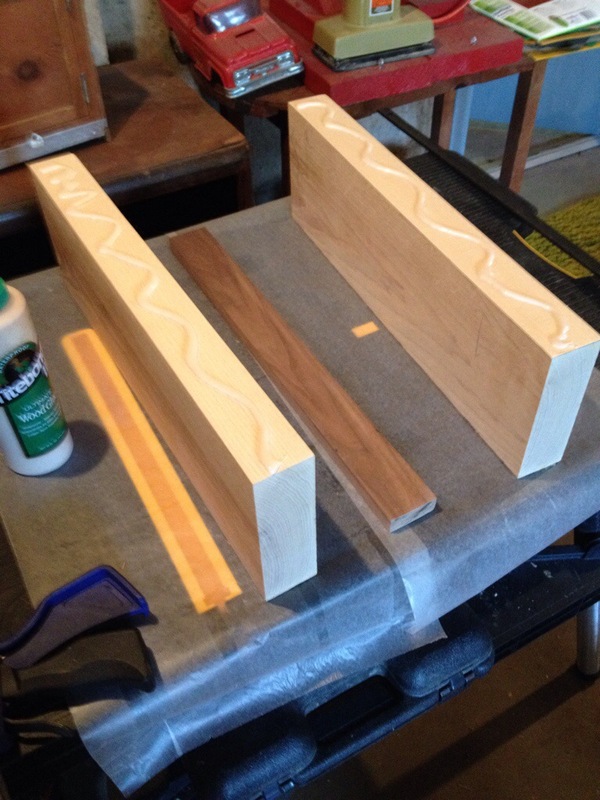 I had to also plane down the walnut center board on one body piece because it had cupped and bowed during transport. Once I got a few extra wide quick clamps, I was able to get good clamp pressure and the wood glue joints dried overnight. Day 2 was spent using a surform rasp plane to knock down any high spots on the body. 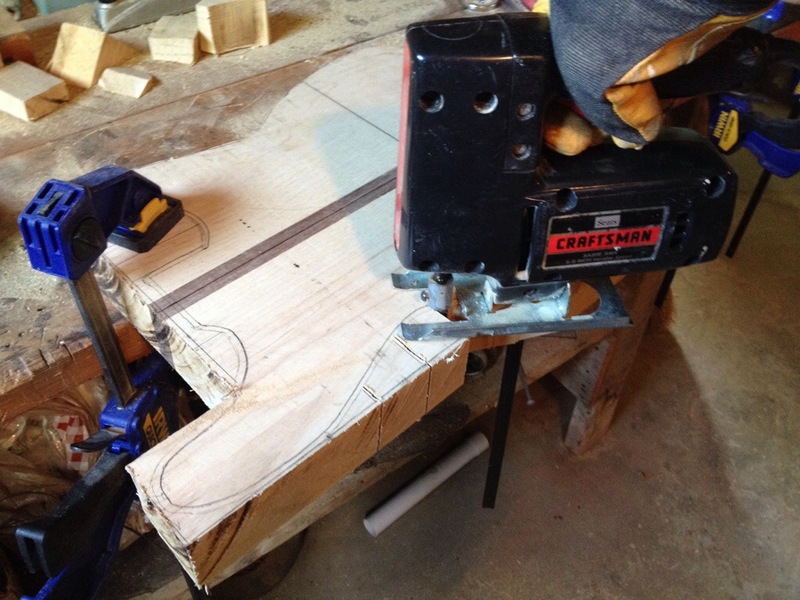 The next step was tracing the templates and rough cutting the timbers. This was grueling work for my dad’s old craftsman jig saw that’s older than me and in the end, a part of the tool holding the metal foot of the jig saw broke and brought things to a grinding halt. After the trip to Lowes for a replacement and a nice bench plane to augment the work from the Surform, it was much quicker and easier going. At this step my time was up and it was time to return home and pick this up another weekend. 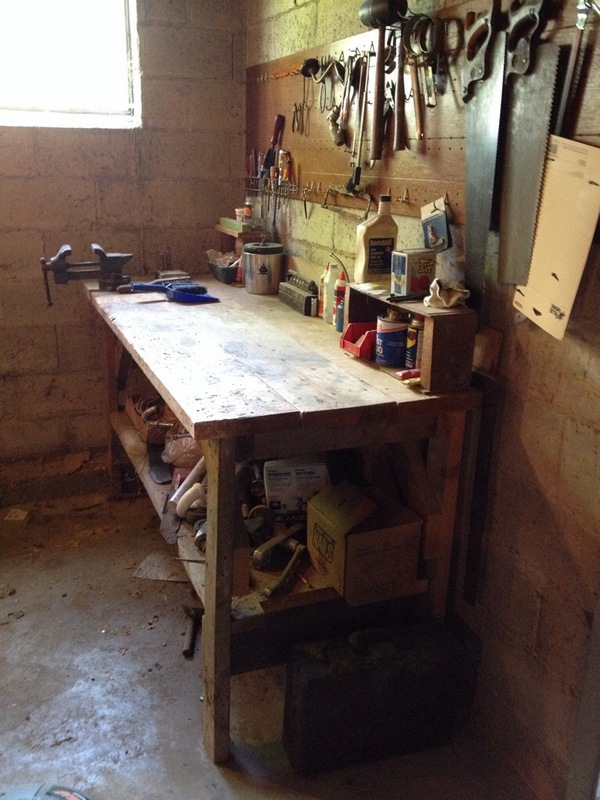 It was a somewhat mystical experience to work in my late grandfather’s shop and I felt as though I was getting to know him how guys bond over tools and the way they keep their shop. Despite years of extremely limited use for minor household and yard maintenance tasks, I could see the full potential of this place and try to imagine it as it once was in its prime. It might just have been the first wood working project worked on there in ten years or so since my father made wooden boats on strings with us as young kids. The endless unexplored corners still hold secrets worth exploring and there’s so much there to sort through. I imagine over time I will try to go through more of it for the sake of both cleaning up and making full use of it on visits. This last weekend was busy with other things but I plan to do more work on this project during the week nights, yet I don’t want to rush through it. I have come into possession of a full size plunge router that Nancy gave me from her basement which is exciting because I now can get and use larger stronger bits and take the body to size in a single pass. 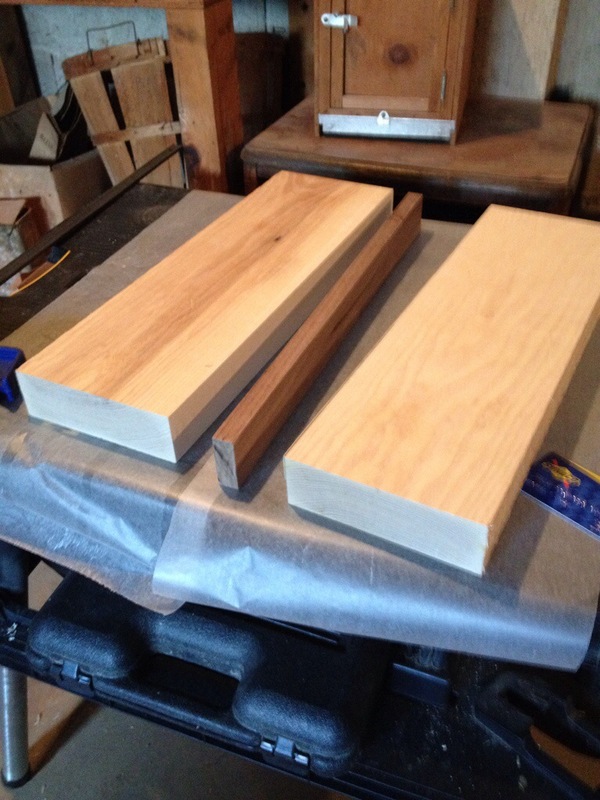 This will also be a beast for hardwoods and for plunge pocketing. And I will be able to drastically diversify my collection of router bits unhampered by restrictions of shank diameter. Once I can get some extra cash, I may even find a suitable table that fits this router to make the full size router table and open even more possibilities. I could even use this as a poor man’s jointer and a biscuit joiner and even toss sanding drums in the chuck to make a poor man’s spindle sander. 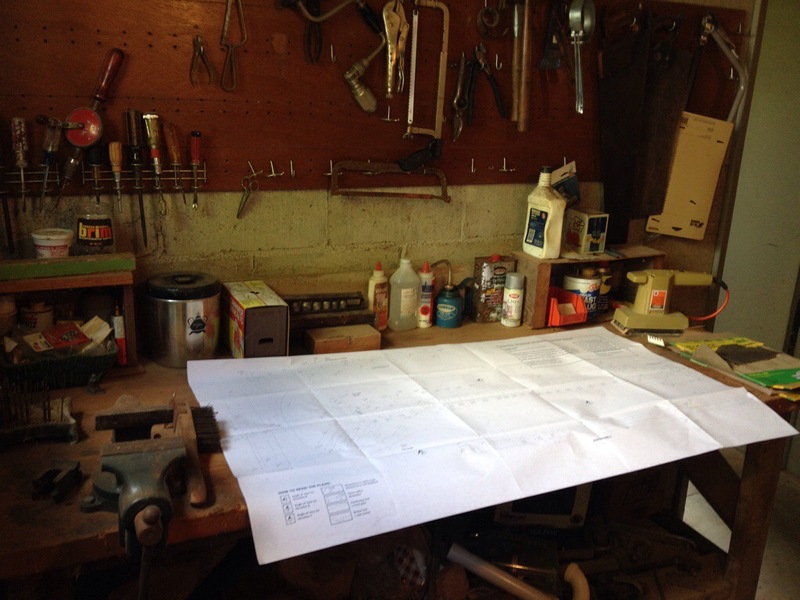 Also I plan to set up the giant architectural plotter that a member brought on loan to the MakerBar and print out more precise templates than I can draw by hand and use the drawings to create cardboard or other types of master templates for shapes. Once I perfect these I can get more permanent master templates laser cut from acrylic or MDF or melamine (or even thin metal). Though they may lack the flair of hand cut templates, they increase the precision and make them also have a virtual master CAD backup even if the physical master gets lost or damaged. 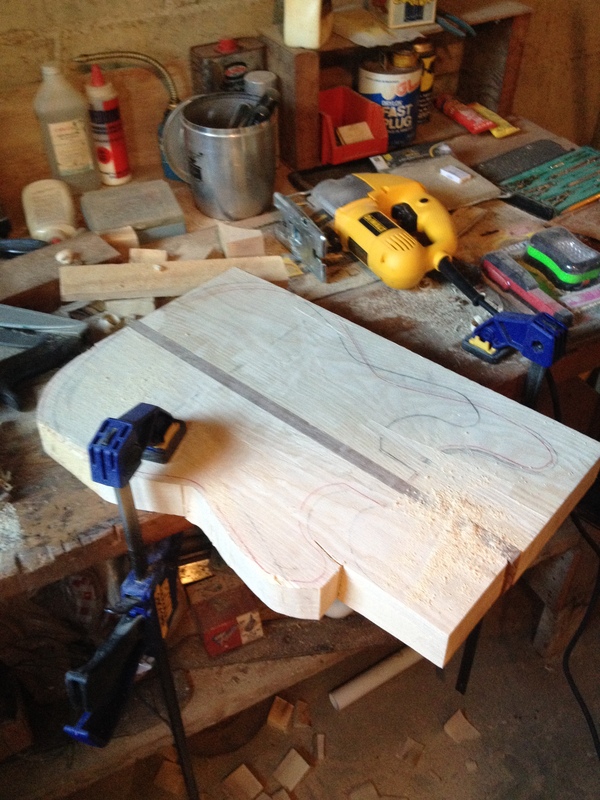 This weekend will also hold more research on components and neck hardware (tuning pegs, bridge hardware, pickups, fret wire, truss rod, nuts, pots, jacks, caps, and wire). It’s something I can’t rush but I need to start so I can get dimensions to include in the templates but also to measure before performing final cuts. 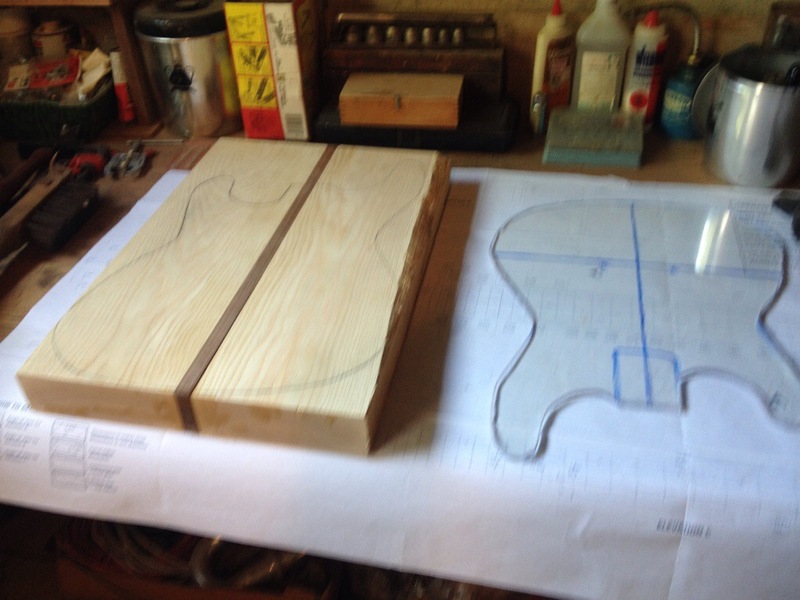 This entry was posted in Just for Fun, Music, Projects, wood working and tagged guitar, Memorial Day weekend, Projects, woodworking. Bookmark the permalink.